Excited about new technology? Stumped on a problem? Trying to keep up with new software releases but don't have time to read an entire book? 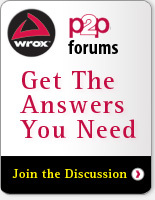 Then Wrox Blox are the answer! Written by the best programmers in the their fields, Wrox Blox are short informational pieces and code that will help get you up-to-speed and keep you up-to-date. Build the knowledge you need quickly on a wide variety of topics. Prices starting at $6.99. Check out a free sample of a Wrox Blox today!